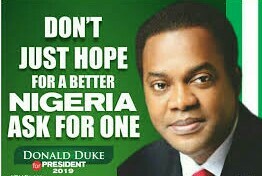 Former Governor of Cross River State, Donald Duke, has emerged as the Presidential candidate of the Social Democratic Party (SPD) for the 2019 general election. Duke polled 812 votes to defeat his close rival, former Minister of Information, Prof. Jerry Gana, who polled 611 votes. The party’s National Convention held at Old Parade Ground, Abuja. The Convention Returning Officer, Dr Abdul Isiaq, declaring the results of the presidential primary election at the early hours of Sunday, said Mr. John Dara, former Special Assistant to Lt. General Theophilus Danjuma, former Defence Minister, scored 104 votes. He also announced that former Ambassador and former Minister, Prof. Iyorwuese Hagher polled 72 votes; former Ambassador, Felix Osakwe scored 10 votes, while the number of invalid votes was 63. Duke in his acceptance speech, described his emergence as a collective victory for all aspirants that participated in the contest, as well for the party and the nation. He said that primary was just a step in the contest, saying he will go through the nation to campaign and sell the party and it’s policies to citizens. NAN reports that he said that Nigeria was not a divided nation but a country of common purpose. He said if Nigerians were productive and abide by rules and regulations, the nation would grow from strength to strength. “This is what good governance is all about and that is what I stand for."